Fintech companies and invested funds are on the rise. As mentioned in a recent post by Pascal Bouvier, Sizing The Fintech Opportunity, there were $12.04 billion invested in Fintech in 2014. Forbes published their Fintech 50: The Future of Your Money list of companies leading the industry. As with any such list, we love to provide better insight into how these companies are performing. We’ve used the Mattermark Growth Score to rank all 50 companies. Below are the top 10 on the list and you can download the full spreadsheet here. The spreadsheet provides each company’s Mindshare Score, URL, location, total funding, all investors, employee count, employee count month-over-month change, current funding stage, estimated monthly uniques, and last funding date. 1. Zenefits (Mattermark Growth Score: 6,892) – Free cloud-based software to help small businesses automate payroll and benefits. Makes money off commissions on health insurance. 2. TransferWise (Mattermark Growth Score: 1,659) – Chops the high fees individuals and small businesses pay for international money transfers by (invisibly to customers) matching buyers and sellers of each currency. 3. Stripe (Mattermark Growth Score: 1,527) – Online and in-app payment platform with easy-to-use customer interface. 4. Avant (Mattermark Growth Score: 1,522) – An online lending platform, which makes it easier and cheaper for people around the world to borrow money responsibly by leveraging big data and machine learning to issues loans. 5. Prosper (Mattermark Growth Score: 1,386) – A peer-to-peer lending marketplace, allowing people to invest in each other in a financially and socially beneficial way. 6. Xapo (Mattermark Growth Score: 1,153) – Stores Bitcoin for wealthy investors on encrypted servers scattered across the globe and offers digital wallets used by consumers from developing countries to shop online. 7. SoFi (Mattermark Growth Score: 1,101) – Offers student loan refinancing, personal loans and mortgages to young borrowers with high-end jobs and degrees. 8. WorldRemit (Mattermark Growth Score: 952) – Phone app for money transfers to friends and family abroad, typically charging 2% to 3% on a $200 transfer, compared with 8% current average. 9. 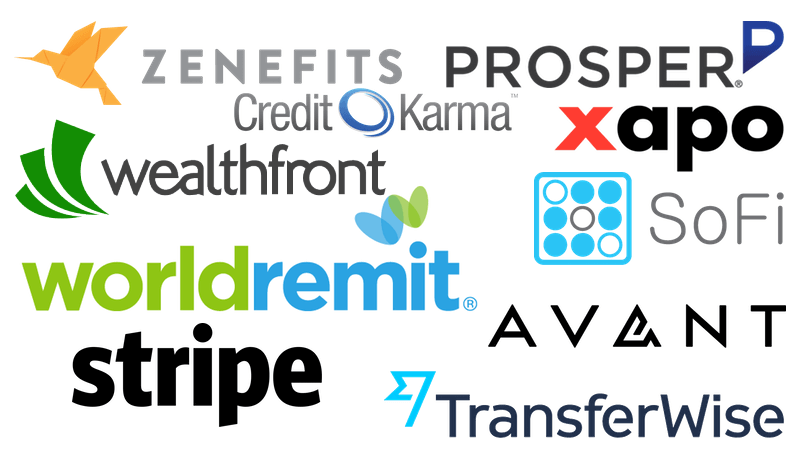 Wealthfront (Mattermark Growth Score: 875) – The largest and fastest-growing automated investment service managing over $3 billion in client assets. The service combines world-class financial expertise and leading edge technology to provide sophisticated investment management at prices affordable for everyone. 10. Credit Karma (Mattermark Growth Score: 863) – Provides truly free credit scores and credit monitoring to consumers.